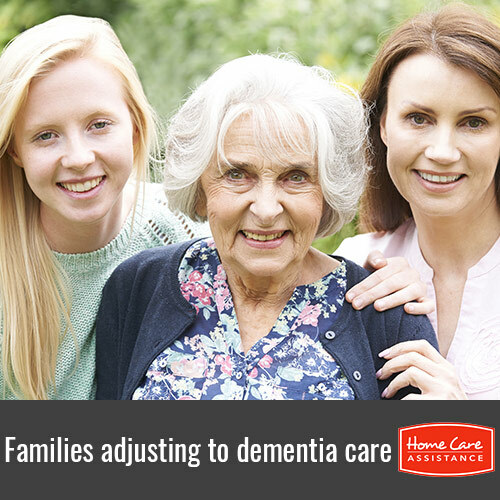 Some families may find it challenging to care for a senior loved one with dementia, especially when adjusting to the behavioral changes associated with the condition. Harrisburg dementia care experts recommend adopting the following strategies to respond to your loved one from a place of understanding. Seniors with dementia often find it difficult to follow a conversation or to find the words to express themselves, which can lead to frustration for both you and your loved one. Try adapting the communication to meet your loved one’s new capacity. Whenever possible, allow your loved one to complete tasks independently. Having to rely on others can lead to feelings of insecurity and a loss of self-esteem in seniors with dementia. Focus on praising successes and avoid the temptation to correct every mistake. It is common for seniors with dementia to exhibit behavioral changes, including suspicion of others, agitation, restlessness, and outbursts of anger. These behaviors may be a sign your loved one has a need that is not being met, such as hunger, thirst, or needing to go to the bathroom. By addressing the underlying need, you can often address or even eliminate the unwanted behavior. As your loved one’s condition progresses, you may have to employ a variety of strategies to manage the condition. For example, reminders or prompts can help your loved one remember important information. Many families also find it helpful to hire in-home elder care Harrisburg seniors can rely on to assist with caregiving duties. If your loved one has been diagnosed with dementia, Home Care Assistance can help. We are a leading name in senior in-home care and provide flexible part-time and live-in care Harrisburg seniors can depend on. Our caregivers are also trained to provide specialized care for seniors with dementia, Alzheimer’s, and Parkinson’s. Call (717) 540-4663 to get the help your loved one needs and request a free in-home consultation.